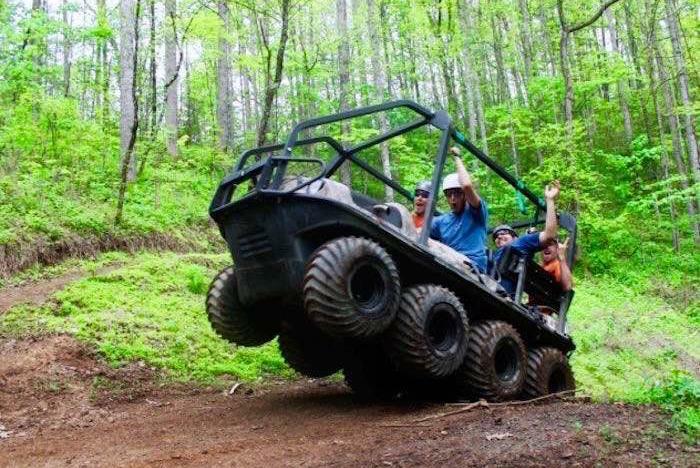 Say goodbye to a leisurely nature walk and hello to the extreme Bear Crawler ATV Adventure in the Smoky Mountains. This off-road exploration will have you dodging trees, riding through water, and scaling the trails to get to the top of the mountain for views of the Smokies you won’t find anywhere else. Plus, along the way, your tour guide will tell you all about the tales and history of Foxfire Mountain. Buckle up! Experience views of the Smoky Mountains unlike anywhere else. When you reserve a Bear Crawler ATV tour, you also get the Discover Foxfire Pass at no additional charge. ATV adventures available year round. 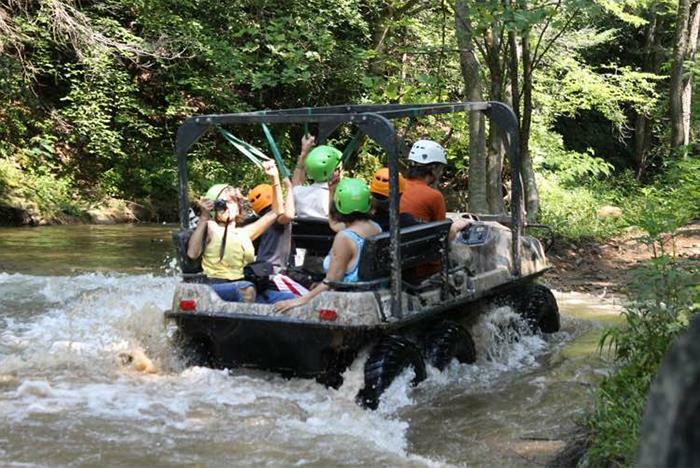 The Bear Crawler ATV Tour is fun for the entire family, including kids. 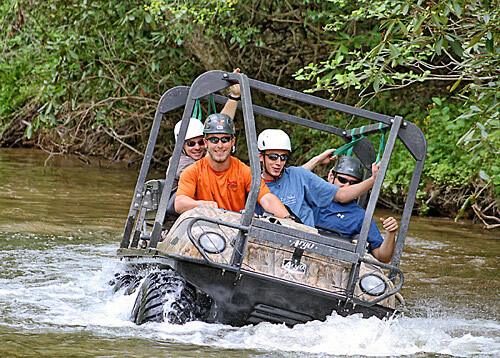 Take a ride on our one and only Bear Crawler Adventure of the Smoky Mountains. 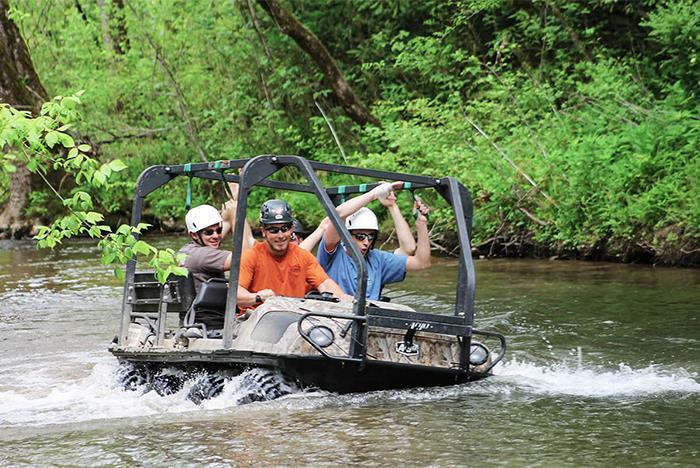 Experience nature from an extreme 8-wheeled drive ATV on rugged off-road trails dodging trees and riding through water to make it to the top of the mountain. This awesome adventure really offers a unique view of the forest like you won’t get anywhere else in The Great Smoky Mountain Area. Sit back and listen to tales of Foxfire Mountain as our driver/guide takes you back in history. This rugged tour will take you up and down the mountains and through the water located on our 150 acre family farm. This open air vehicle is fun for the whole family and can accommodate up to 5 guests per trip. Children must be 3 years old, be able to sit by themselves and be buckled in a seat belt. Children 12 years old and under must be accompanied by an adult. Bonus: When you reserve a tour on the Bear Crawler you automatically get the Discover Foxfire Pass at no additional charge. Discover Foxfire features America's longest swinging bridge, canopy bridges up in the trees, 1.5 miles of hiking trails leading to Lost Mine Falls and meandering around the creek, and our little adventurer obstacle course. 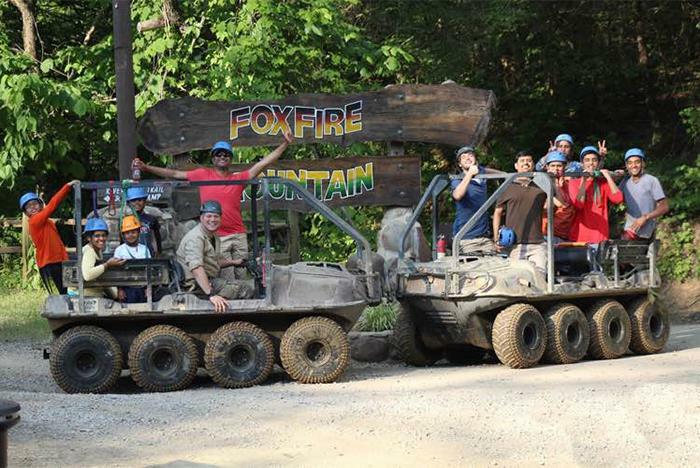 Foxfire Mountain Adventure Park is a beautiful 150-acre adventure park nestled in the Tennessee Smoky Mountains. It's chock-full of excitement, zip lining, ropes courses, swinging bridges, great food and so much more! For more details see our Foxfire Mountain Adventure Park listing. How old do I have to be to participate? Children must be at least 3 years old and able to sit by themselves. All participants must be able to be buckled in a seat belt. Children 12 years old and under must be accompanied by an adult. Do I have to sign a waiver form? Do I need to make reservations? No. An ATV is an open-air vehicle so please dress appropriately. How many people can ride on an ATV at once? The vehicle can accommodate up to 5 guests per trip. Where is Foxfire Mountain located? Save on your entire order by bundling your tickets with any hotel. After you add your tickets to your cart, continue the Bundle it! process by selecting the perfect hotel room. Head to checkout to complete your purchase and see the extra savings! Contact us for support or help booking your trip at 1-855-271-6594.